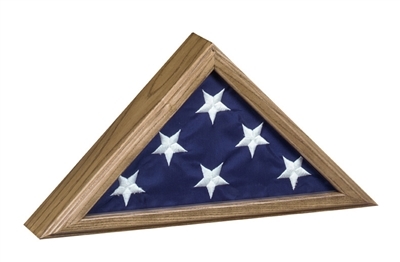 Choose a capitol flag display case if you have received a flag that was flown over the US capitol. Each capitol flag case – made in the US – has a simple triangular design and is crafted from oak, walnut or cherry wood. Available in different finishes, your flag case keeps your family memorabilia safe. Note: Brass nameplate is not available for this flag case due to small size of case. Available in solid walnut, oak or cherry. Opens from the back with turn buttons. Protects & preserves cherished memorial. Designed to accommodate a 3' x 5 ' flag. For Available Accessories see lower right hand portion of this page. The "Capitol" flag case is manufactured right here in the USA and is specifically for a 3' x 5' flag. They are crafted from solid oak w/natural oak finish, solid walnut w/heirloom walnut finish, or solid cherry w/natural finish. Each flag case is assembled by hand utilizing an incredibly strong glued Dovetail joint then put through a seven step finishing process.